Would you like to make 3D cloth vessels like these? This is part of the textile art crafting hobby that has produced a very wide variety of designs and creations. 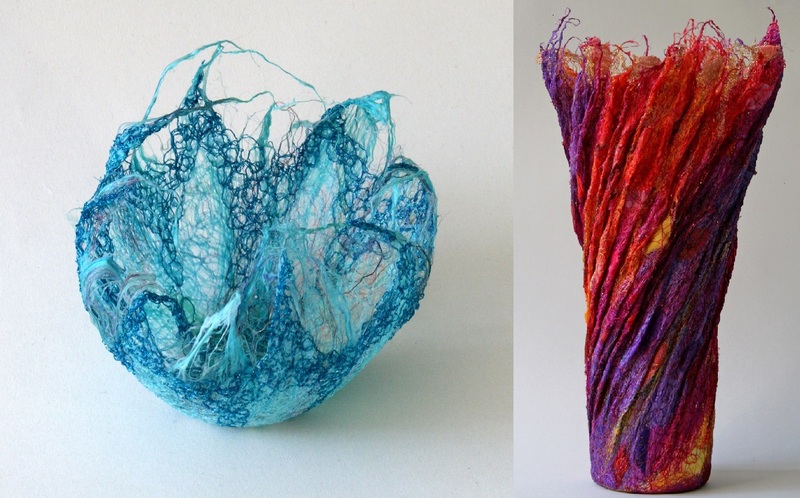 The vessels pictured here are the work of textile artist Jo Hyam, who also does 2D art with cloth, and you can see it’s not only the form, but the color, Hyam is interested in. “These 3D pieces are made by sandwiching silk fibres and tiny pieces of fabric and textured threads between layers of soluble film, which will have been cut to a pattern shape.” Elsewhere on the Blogunity site, we have tutorials written on how to wet felt and a bunch of things about the craft. Just go to menu and type “wet felting” into the search box. “This sandwich is machine stitched copiously, before, possibly, adding more layers of fibres and stitching again,” Hyam continues. “Most 3D pieces are made up of two separately stiched layers stitched together before the film is washed away, leaving a completely new double-layered piece of lacy cloth. I may add hand stitching, beads, or glitter. The process involves making a thick sheet or shape of felt fabric by taking felt, tearing it apart, putting those tears together, wetting them, and pushing them and rubbing them together, so they sort of mat, the way hair mats when you twists and fray it together. She’s not kidding about the time. Even basic wet felting projects take a lot of time. You can’t just cut and sew one together in a few minutes, even if you’ve done dozens before and know exactly what you’re doing. It’s a time-consuming process to wet felt. The round blue work here is “Untitled H.” It’s 10cm £35 ($approx 60 USD). Silk fibres, mixed fabrics and threads, machine stitch. The taller, redder work is “Sunset” H. IT is 38cm £165. Silk fibres, mixed fabrics and threads, machine stitch.